Ever since I installed rope lighting behind crown molding during a 2004 remodeling project, I’ve wanted an opportunity to do it again. Now seven years later, I finally got my chance. The project pictured is my screen porch. I spend countless hours on this porch, working, relaxing and entertaining. 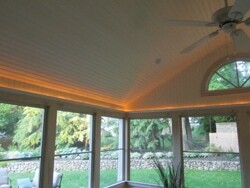 I love this room and recently decided to install the crown molding with rope-style accent lighting. Rope lighting is a plastic flexible tube that is made up of tiny bulbs, either incandescent or LEDs. Rope lights are a super easy way to introduce accent lighting and color into your lighting design. They work so well because of their versatility. A common use for rope lights is as a cove or accent light. 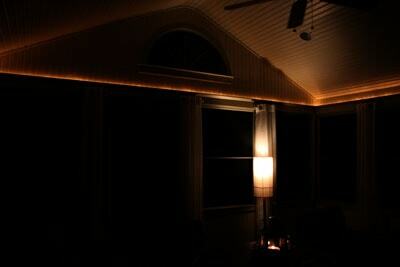 Rope lighting placed behind crown molding can create a warm accent glow and makes a great DIY project. Rope lighting can be bought in predetermined lengths. 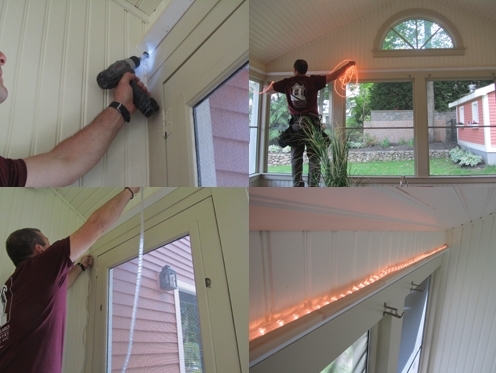 When I’m working at a client’s house and hardwiring the rope lighting, I prefer to cut the tube between lights at the exact length needed and splice together my connections. 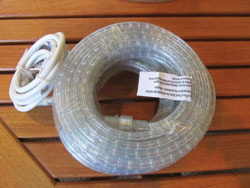 Rope lighting can be purchased at any hardware of electrical supply store. Kits are available to create custom lengths. 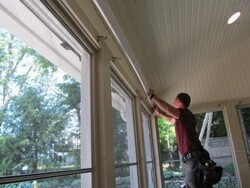 Shown is the screen porch before installation. Installing crown molding in any room greatly enhances a home’s decor. Using rope lighting in combination with crown molding is a great way to provide both an inviting mood light and aesthetic beauty. The warm glow becomes a focal point and really draws you in! Combining crown with rope lighting is easy, as long as you follow a few simple principles, such matching the existing décor. I already knew that rope lighting would create spectacular accents. The problem I had was choosing the molding. 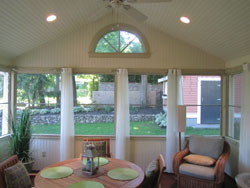 The screen porch has a simple country design look, complete with tongue-and-groove beadboard, a mahogany wood floor and wide, flat 1×6 window casing. I initially thought crown molding would be too fancy for this room. I almost gave up on the notion when I realized that I could make a simple Shaker-style molding out of 1×4 flat boards. The Shaker-style molding was made from 1×4. The Shakers, a religious group, approached work as an act of worship and aspired to a combination of simple yet beautiful design and fine craftsmanship. To this day, Shaker furnishings are recognized for their elegant simplicity and exquisite workmanship. Why not borrow from their lead? Once I decided to make my own Shaker-style crown molding, I measured the room and went to the store to buy the rope lighting. I took the easy road and bought rope lighting at a factory-determined length with a wall plug. I think I spent $40.00 on the lights. An electrical supply store can provide you with the tools and materials needed for custom size rope lighting. I started by buying 1×4 pine boards, longer than the 14-ft. span of the three screen porch walls. Using my table saw, I ripped all four edges of these 1×4’s to achieve the desirable spring angle. First I ripped the board to width and then ripped the two opposing edges at 35 degrees, which gave me the wall angle and top edge of the crown molding. The two opposite side rips were made at 45 degrees for a decorative beveled edge. Once all of the boards were ripped, I used a small block plane to remove the saw marks, lightly sanded the ripped edges and then primed all the bare wood. Tip—When ripping long boards like this, make sure you support them with extension rollers to keep the work piece level and in line to the saw blade. 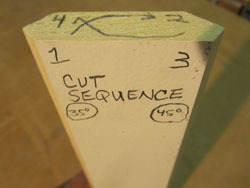 Cutting the opposite edges at 45 degrees provides the decorative beveled edge. 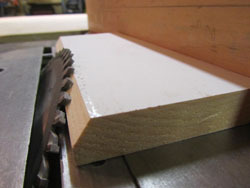 The boards were first ripped to width on a table saw and then cut with a 35-deg. spring angle. Measuring wall-to-wall, I cut my new crown molding to size. I only needed to miter two corners of the screen porch because the other ends “dead-ended”, or “butted”, into the house wall. The molding only runs along the outside walls and over the screen panels. Tip—When working alone and measuring long distances, insert a nail close to the opposite wall and hook your tape onto it. This shows the cut sequence. This photo shows the orientation of the cuts. A scrap block was used to guide the layout. 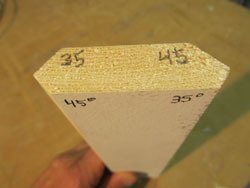 To double-check the corner miters, I first cut scrap pieces of molding with 45-deg. angles and tested it prior to cutting and installing my longer boards. 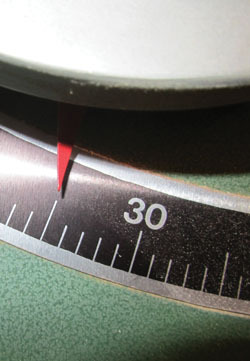 I use this test piece to check the accuracy of the miter and make any necessary adjustments. (Not all wall corners are a perfect 90 degrees.) If the heel of the miter is open, I re-cut the scrap molding to 44, 43 or 42 degrees, finding the best fit to close the gap. 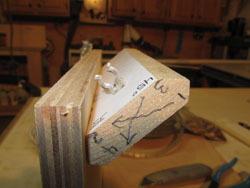 The same method applies if the scrap molding miter point is open but the heel touches. In this situation, I cut my scrap piece at 46, 47 or 48 degrees to close the gap. Once I have the scrap pieces fitting tight, I cut my molding to those angles. I use the “upside down and backwards method” to cut my crown molding on a miter saw. The next molding to be installed has two miters. 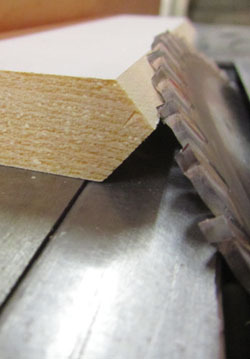 The left-hand miter receives the same angle as the scrap molding. I then dry-fit the opposite corner with scrap pieces and cut that miter as well. The lighting should remain hidden in the channel behind the molding to provide soft, ambient lighting. 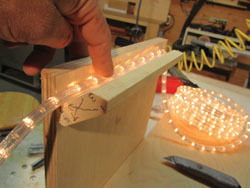 Make sure the molding is large enough to conceal the clips that hold the rope lighting. When ripping long boards, support them with extension rollers to keep the work piece level and in and in line to the saw blade. I used Gorilla wood glue to secure the miters and nailed off the molding every 12 inches along the bottom edge. When working alone and measuring alone and measuring long distances, insert a nail close to the opposite wall and hook your tape onto it. 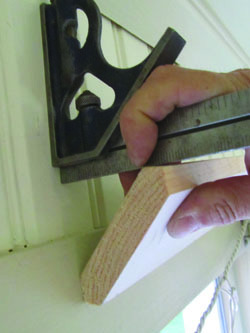 It’s a good practice to cut the molding at the exact length or 1/16-in. longer. I like to cut the molding slightly longer so I can bow out the molding in the middle. I like to get the ends in place and then snap the molding in for a super tight fit. 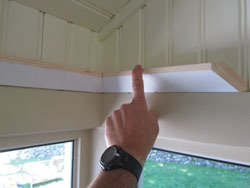 A scrap piece of molding helped to determine the exact corner angles for out-of-square walls. I set the molding ends in place and then release tension on the bow and allow the board to tension inward. If done right, slight hand pressure will hold the crown to the wall and the finish nails will fasten it in place. Doing this keeps the miters pressed tightly together and allows for the glue to do its job. Open Molding or Support Blocks? On this project I determined that the molding only needed to be 2 inches wide to accomplish what I needed and to be in proportion with my screen panel trim. Using such a small molding meant that I could fasten it along the bottom edge and I did not need inside support or nailing blocks. On previous projects I have used much larger moldings, which necessitated that I provide support behind the molding. For those projects, I made custom mounting blocks with holes drilled in them to allow the rope lighting to pass through. Without the holes, the rope lighting would have had to bend over the mounting blocks and then have been visible from below. Since the molding is open on the top, I installed 8d finish nails into the molding along the bottom edge and into the wall. 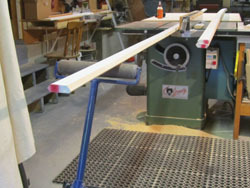 The molding was cut on a miter saw using the “upside-down and backward” method. A friend of mine once said, “If it’s worth doing, it’s worth gluing.” A little glue along this bottom edge helps keep it all together. The molding was fastened with finish nails along its bottom edge. It helps to cut the molding slightly longer than the wall so the pieces snap into place and keep pressure on the miter joints. I chose to use my Paslode cordless finish nailer, but hand-nailing works too. If you hand-nail, you will need to predrill prior to driving the 8-penny nails. The finish nailer does not have a cumbersome cord and it allows me to set the exact depth of my nails. After all three crown molding boards were installed, I made sure all of the nails were set and filled with wood filler. Tip—I find it requires less sanding effort to fill nail holes flush and to do a light second coat only if necessary. This two-coat method is still faster than “over applying” the wood filler and having to sand it smooth. 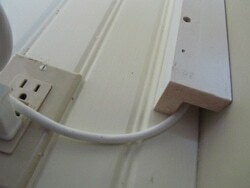 A small hole provided access for the rope lighting to be routed behind the molding. After the second coat, I lightly sand the wood filler and “spot” prime those areas. I caulked all of the seams at this time as well. After applying a final coat of trim paint, the installation looked like it had always been there. I then cut a hole into the “house” side of one of the moldings. This hole was used to pass the rope lighting down to the electrical outlet. To hide the rope light cord going to the outlet, I built a chase out of poplar wood. The chase hides the rope lighting and allows for the rope lighting to be passed down to the outlet undetected. A small, narrow channel conceals the rope lighting as it runs from the outlet to the crown molding. Shown is the finished project. I ran the rope lighting through the chase, into the hole and around the room behind the molding. The lighting came with plastic clips and screws. These clips worked great for keeping the rope hidden down behind the crown molding. Rope lighting similar to this can be purchased at any hardware or electrical supply store. Kits are available to create your own custom lengths. This whole project, including buying the rope lighting and wood, took only 6 hours but will give me years of enjoyment and bragging rights!